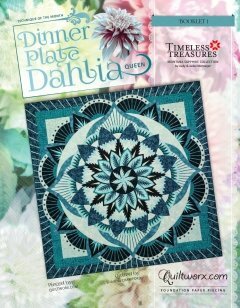 Join CI Jenny Clark for the new 2019 Technique of the Month, Dinner Plate Dahlia. This is a 6 day workshop where she will walk you through each step of the process to learn new techniques and get your quilt going. We will have limited kits available for this quilt, so call us to reserve your kit ASAP! Jenny can help you design your own colorway in Quiltster as well for a small fee, you will have to call and schedule a time with Jenny. There will be a wall size 80" x 80" and queen size 90" x 90" version for this quilt. Get signed up soon, as there will are limited slots available. If you can't attend a 6 day workshop, we will also have a once a month class for 6 months starting in July through December. Price is for the class only. You must purchase the pattern and fabrics required for the quilt for this class. Materials Included: A class supplies list will be provided once you enroll in the class. Requirements: The pattern and fabrics required for the size quilt you choose to make for a wall or a queen size. There will be limited kits available to purchase. Jenny can help you design your quilt in your own colorway for a small fee.